Lexicon Episode Guide - Wormhole X-treme! Martin Lloyd, Dr. Tanner, and their compatriots, refugees from an alien world, had been living incognito in Montana. 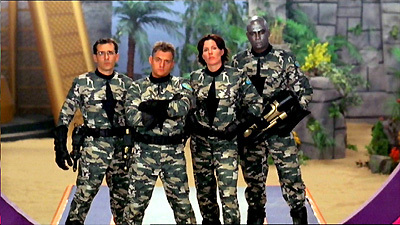 However, their encounter with SG-1 had alerted the NID to their presence, and the time has come for their backup plan, the spaceship which they had left on a timer and which is due to reach Earth in three days. In the meantime, Martin has left Montana behind for the bright lights of Hollywood. He has sold a script entitled "Wormhole X-Treme!" which bears an uncanny, if exaggerated, resemblance to SG-1 and the Stargate Program, and he is currently working as the creative consultant for the project. Investigating the spaceship headed for Earth, SG-1 travels to Hollywood to conduct surveillance on Martin's house, and O'Neill goes undercover as the Air Force technical advisor for the program. However, Martin doesn't recognize O'Neill. In fact, he has no memory at all of Montana or of the events of last year. The vitamins he has been taking are laced with chemicals that suppress his memory, and even when O'Neill confronts him with the truth, he refuses to believe it. Further complications arise when O'Neill and Martin are captured by Tanner, and Carter and Daniel are detained by the NID, who now control the investigation. Tanner injects Martin with an antidote to restore his memory. It had been his choice to forget his past and begin his new life on Earth, but now his friends need his help, and the location of the mobile computing device in his possession that will control the approaching ship. As television filming proceeds, the device is located among the props, and O'Neill agrees to turn it over to Tanner, allowing them to make their escape just as the enormous ship appears overhead, and the NID forces arrive on the scene. However, Martin chooses to stay behind on Earth, having already found his new path. At 2:30am, the Kepler Space Probe picked up the image of Martin's ship as it passed by Mars. It was first thought to be an asteroid until it began changing course and accelerating. The energy signature was consistent with Martin's pod found in Billings, Montana. The ship was on a timer as a backup plan. It was now on course for Earth and would arrive in three days. The mobile computing device that Martin took from Tanner was required to access the ship. The Air Force allowed production of "Wormhole X-treme" because of plausible deniability. The Air Force had gotten Martin a job in real estate, but he wasn't happy, he wanted to forget, and he began taking vitamins laced with the same chemical that had suppressed his memory before, in order to forget. In another month the long-term memory loss would have been permanent. Agent Malcolm Barrett and NID forces were given full authority over the investigation to recover Martin, his compatriots, and their ship. Grell never says a word. O'Neill's cell phone goes off during shooting. Colonel Danning has two scars. Grell the Robot never manages to raise only one. WHERE DID ANISE COME FROM? Dr. Levant is buried in boulders. The full shot of a statue appears at the apartment. Research says that shows with "X" in the name get higher ratings.